This is another fun piece of kitchen equipment I've grown to love. 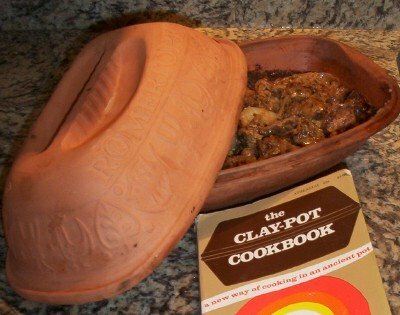 It's a clay pot baker made by the German company Romertopf . You soak the pot in cold water before baking. The moisture absorbed by the clay and a high oven temperature combine to make juicy roasts with little fat. Meat, though tender, doesn't fall apart like it does in a crockpot. I spot Romertopfs often at yard sales--one of those bulky items that people get rid of when decluttering or moving. The smallest size Romertopf bakers go for about $26 , so look for one around the $2 price point, secondhand. Once I saw the gigantic turkey roaster at the Habitat Store. Even I couldn't make room for that one!